Teacher support materials and workshop/conference resources are available on Maple (mapleforem.ca). Maple is Manitoba Education and Training’s private professional network with shared content available to all Manitoba educators. The Human Ecology full credit courses provide outcomes from three areas of study (family studies, food and nutrition, textile arts and design). The framework of outcomes provides flexibility to apply to all the environmental design domains: architecture, landscape architecture, interior design, regional and urban planning. 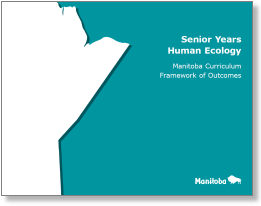 The human ecology education perspective on this framework of outcomes focusses on the interrelationships among people and housing and interior design in multiple dimensions. This course prepares students for a caregiving role with infants, toddlers and children through the study of child development. The skills and knowledge are applied to a 40-hour practical experience with children where students will observe, guide behaviour, ensure health and safety, and participate in play-based learning experiences. This course provides the foundation for further study within the field of early childhood education and related careers. The Early Learning and Child Care (ELCC) program (Department of Families) may approve completion of the Grade 12 Applied Family Studies 40S (course code 0491) as meeting the 40-hour post-secondary course requirement for Child Care Assistants.